Midtown Café owner Randy Rayburn has added breakfast service at the establishment, beginning Monday (Sept. 19). The restaurant is located near Music Row at 102 19th Ave. S.
To celebrate the launch, 10 percent of breakfast and lunch sales will be donated to various non-profits during the first week, including Brian Uhl Scholarship Fund to benefit the culinary students at the Randy Rayburn Culinary School at Nashville Community College (Monday), Our Kids (Tuesday), Project Return (Wednesday), Country Music Association Foundation (Thursday) and Monroe Carell Jr. Children’s Hospital at Vanderbilt (Friday). 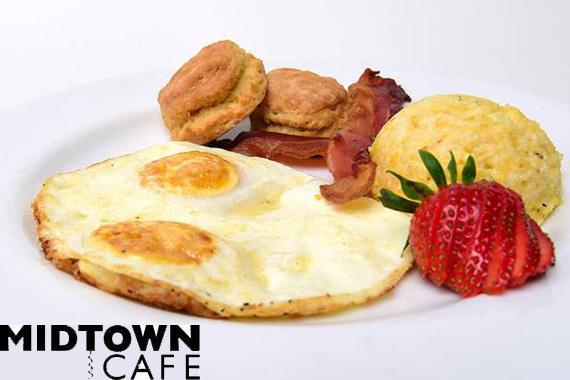 Breakfast will be served Monday through Friday, 7 a.m. to 11 a.m., with limited breakfast service until 2:30 p.m. The new menu, currently under development, will include omelets, pancakes, French toast with apricot crème fraiche and a Wyoming-inspired dish of Tennessee trout stacked on a bed of fluffy scrambled eggs. Soon to celebrate its 29th anniversary, the cafe continues weekly lunch service from 11 a.m.—4:30 p.m., and dinner Monday—Saturday.